Global factors influenced the fur trade in Canada. Model of a steamship carved from the tusk of a walrus. 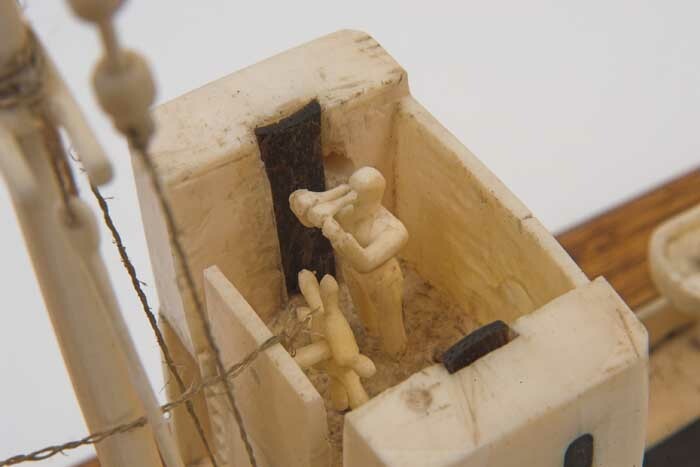 The rigging is attached with sinew thread, nails and glue. The darker material used to make the ship is baleen, a substance that is taken from the mouths of whales. Baleen comprises stiff plates of keratin that grows down from the gums of the upper jaws. Keratin is the tough protein found in hair, nails, scales, horns and hooves. It is elastic enough to allow the whales to filter or “comb” through their food as is the case when they strain water to feed on the small zooplankton. Read about the Canadian Inuit - enter 'Inuit' in the search box to your left. Have you seen our other trade artifact from Siberia? Check the Beaver Index - e.g., walrus, whales, Siberia, etc. Check the Beaver Index - e.g., An Era Closes: The Last Voyage of the Steamship Watson Lake, by Norman Soars, March 1953. This carving was collected from the Chukchi, who are Indigenous people of Chukotka, which is located in the far northeast corner of Siberia. The Chukchi are both interior reindeer breeders and herders, and coastal hunters who primarily depended upon whales, seals, and walruses. The Hudson’s Bay Company conducted a trade in furs in Siberia for a short period in the early 1920s at Petropavlovsk on the Kamchatka Peninsula. The Chukchi are still famous for their bone and ivory carvings. Carvers not only depicted a variety of scenes from traditional life, but also made models of new objects that were introduced to them through contact with Russian and North American traders. Steamers such as the one represented by this model transported supplies, furs and personnel.